Department of industrial engineering, Shomal University, Amol, Iran. Cloud computing is considered to be a new service provider technology for users and businesses. However, the cloud environment is facing a number of challenges. Resource allocation in a way that is optimum for users and cloud providers is difficult because of lack of data sharing between them. On the other hand, job scheduling is a basic issue and at the same time a big challenge in reaching high efficiency in the cloud computing environment. In this paper, “the cloud resources management problem” is investigated that includes allocation and scheduling of computing resources, such that providers achieve the high efficiency of resources and users receive their needed applications in an efficient manner and with minimum cost. For this purpose, a group technology based non-linear mathematical model is presented with an aim at minimization of load difference of servers, number of transfers between servers, number of active virtual machines, maximum construction time, the cost of performing jobs and active servers energy consumption. To solve the model, a meta-heuristic multi-objective hybrid Genetic and Particle Swarm Optimization algorithm is proposed for resource allocation and scheduling. In order to demonstrate the validity and efficiency of the algorithm, a number of problems with different dimensions are randomly created and accordingly the efficiency and convergence capability of the suggested algorithm is investigated. The results indicated that the proposed hybrid method has had an acceptable performance in generating high quality, diverse and sparse solutions. Abd-El-Wahed, W.F., Mousab, A.A. & El-Shorbagy, M.A., (2011). “Integrating particle swarm optimization with genetic algorithms for solving nonlinear optimization problems”, Journal of Computational and Applied Mathematics, Vol. 235, No. 5, pp 1446–1453. Al-Aomar, R. and Al-Okaily, A., (2006). “A GA-based parameter design for single machine turning process with high-volume production”, Computers & Industrial Engineering, Vol 50, pp 317–337. Cagnina, Leticia Cecilia; Esquivel, Susana Cecilia, Coello Coello, Carlos A., (2011). “Solving constrained optimization problems with a hybrid particle swarm optimization algorithm”, Engineering Optimization, Vol. 43, No. 8, pp 843-866. Coello, C.A.C., (2000). “Use of a self-adaptive penalty approach for engineering optimization problems”, Computers in Industry, Vol. 41, pp 113–127. Eguia, Ignacio, Racero, Jesus, Guerrero, Fernando, Sebastian Lozano, (2013). “Cell formation and scheduling of part families for reconfigurable cellular manufacturing systems using Tabu search, Simulation”, Transactions of the Society for Modeling and Simulation International, pp 1–17. Emmons, Hamilton, Vairaktarakis, George, (2013). Flow Shop Scheduling: Theoretical Results, Algorithms, and Applications, Springer, New York. Ergu, Daji, Kou, Gang, Peng, Yi, Shi, Yong and Shi, Yu, (2013). “The analytic hierarchy process: task scheduling and resource allocation in cloud computing environment”, The Journal of Supercomputing, Vol. 64, No. 3, pp 835-848. Goudarzi, H., Ghasemazar, M. and Pedram, M., (2012). “SLA-based Optimization of Power and Migration Cost in Cloud Computing, Cluster, Cloud and Grid Computing (CCGrid)”, 2012 12th IEEE/ACM International Symposium on Ottawa, pp 172 – 179. He, Qie and Wang, Ling, (2007). “An effective co-evolutionary particle swarm optimization for constrained engineering design problems”, Engineering Applications of Artificial Intelligence, Vol. 20, pp 89–99. Huang, Fu-zhuo, Wang, Ling and He, Qie, (2007). “An effective co-evolutionary differential evolution for constrained optimization”, Applied Mathematics and Computation, Vol. 186, pp 340–356. Jaeger, Paul T., Lin, Jimmy, Grimes, Justin M., (2008). “Cloud Computing and Information Policy: Computing in a Policy Cloud?”, Journal of Information Technology & Politics , Vol. 5, No. 3, pp 269-283. Javid, J., (2010). “Modeling supply chain management”, 2nd International Industrial Engineering Conference. Tehran, Iran, 14-20. Kim, Jungyun, Chung, Seong Youb, Yoon, Hyun Joong, (2014). “Multi-agent-based scheduling methods for hybrid cellular production lines in semiconductor industry”, Journal of Engineering Manufacture, Vol. 228, No. 12, pp 1701–1712. Kim, S.J., Kim, K.S., Jang, H., (2003). “Optimization of manufacturing parameters for a brake lining using Taguchi method”, Journal of Materials Processing Technology, Vol. 136, pp 202–208. Kolischa, R. and Padman, R., (2001). “An integrated survey of deterministic project scheduling”, Omega, Vol. 29, pp 249–272. Kuo, R.J. & Han, Y.S., (2011). 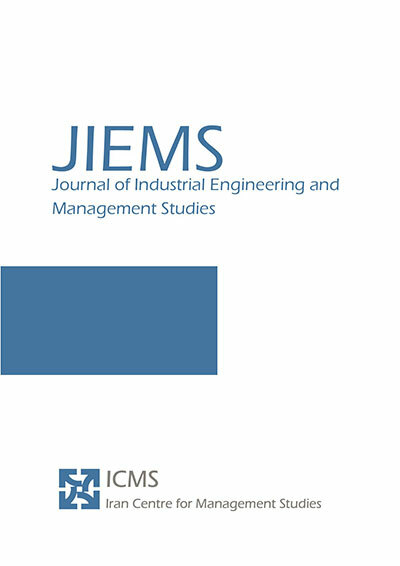 “A hybrid of genetic algorithm and particle swarm optimization for solving bi-level linear programming problem – A case study on supply chain model”, Applied Mathematical Modelling, Vol. 35, No. 8, pp 3905–3917. Moazzami, Majid, Khodabakhshian, Amin, Hooshmand, Rahmat-Allah, (2014). “A New Optimal Under-frequency Load-shedding Method Using Hybrid Culture–Particle Swarm Optimization–Co-evolutionary Algorithm and Artificial Neural Networks”, Electric Power Components and Systems, Taylor & Francis Group, Vol. 43, pp 69–82. M. Garey and D. Johnson, (1979). Computers and intractability: a guide to the theory of NP-Completeness, 1st edition New York: WH Freeman and Company. Mozdgir, Ashkan, Mahdavi, Iraj, Seyedi Badeleh, Iman, Solimanpur, Maghsud, (2013). “Using the Taguchi method to optimize the differential evolution algorithm parameters for minimizing the workload smoothness index in simple assembly line balancing”, Mathematical and Computer Modelling, Vol. 57, No. 1–2, pp 137–151. Pandian M., Vasant, (2012). Meta-Heuristics Optimization Algorithms in Engineering, Business, Economics, and Finance, IGI Global, 1 edition, United States of America. Rodriguez, M.A., Buyya, R., (2014). “Deadline Based Resource Provisioning and Scheduling Algorithm for Scientific Workflows on Clouds”, Cloud Computing, IEEE Transactions, Vol. 2, No. 2, pp 222 – 235. Valdez, Fevrier, Melin, Patricia, Castillo, Oscar, (2011). “An improved evolutionary method with fuzzy logic for combining Particle Swarm Optimization and Genetic Algorithms”, Applied Soft Computing, Vol. 11, No. 2, pp 2625–2632. Wang, Wei-Jen, Chang, Yue-Shan, Lo, Win-Tsung, Lee, Yi-Kang, (2013). “Adaptive scheduling for parallel tasks with QoS satisfaction for hybrid cloud environments”, The Journal of Supercomputing, Vol. 66, No. 2, pp 783-811. Wang, Zhanjie and Su, Xianxian, (2015). Dynamically hierarchical resource-allocation algorithm in cloud computing environment, Springer Science+Business Media New York. Z. Michalewicz, (1996). Genetic Algorithms + Data Structures = Evolution Programs, 2nd edn., Springer-Verlag. Z. Michalewicz, N. Attia, (1994). “Evolutionary optimization of constrained problems” , Proceedings of the 3rd Annual Conference on Evolutionary Programming, World Scientific Publishing, River Edge, NJ, pp 98–108.